In the main application window, click the “Program Colors and Keys” button to open the Keyboard Color Programmer window. 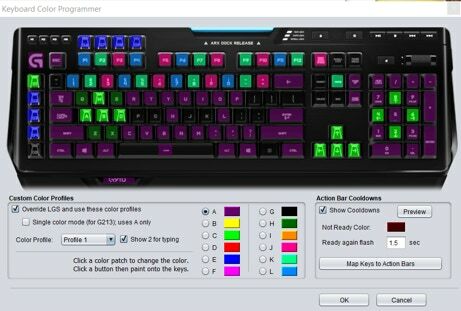 Click and drag your mouse to paint colors onto any of the keys. Click on “Show Cooldowns” to have your choice of keys show an alternate color when their matching action slots go on cooldown. Set that alternate color here. To chose which key lights respond to which action slots, click the “Map Keys” button. Read more about that here. When playing World of Warcraft you can switch to any of the nine color profiles using the slash command /G910profile # where # is 1, 2, 3, etc, up to 9. You can incorporate these commands into a macro for example to change keyboard colors when you change talent specs or druid/worgen forms. If you select the “Show 2 for typing” option, profile 2 will automatically appear whenever a typing bar appears in game (chat, mail, search box, macro, etc.). The previous profile will reappear when that typing bar disappears. If you like to play the game with a minimum number of keys illuminated, many in dark colors, this option lets you enjoy seeing profile 2 with uniform illumination whenever you need to type. When you enable single-color animation mode for keyboards such as the G213, you can still use the color profile switching feature, but of course there’s only one color. The color you place in the “A” spot in the Color Programming window will be used for the entire keyboard.